Main Entrance of the Police Dept. from 7:00 a.m.-3:30 p.m.
ALL DEPOSITS ARE MADE ANONYMOUSLY!! NO NEEDLES/SHARPS ACCEPTED AT ANY LOCATION!! Take Medications to a drop box. Remove your name and personal information. Keep the name of medication on the container and closed. Illegal drugs and/or drug paraphernalia can be put in a paper bag or other container for privacy before dropping them into the disposal box. 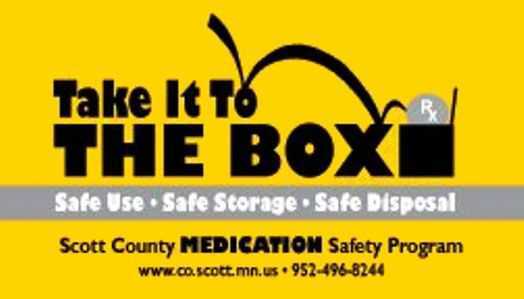 The “Take It To The Box” program is funded by local law enforcement agencies; the Scott County Meth Task Force; and the Scott County’s Sheriff’s Office. If you have a large amount of items to dispose of, please use multiple bags so the box does not jam. Shakopee - Scott County Sheriff’s Office - Main Lobby at 301 Fuller Street - corner of 4th and Fuller. Savage - 6000 McColl Drive - Front Vestibule of the Police Dept. Prior Lake - 4649 Dakota Street SE - Front vestibule of the Police Dept. Jordan - 210 East First Street - Front Main Lobby at City Hall from 8:30 a.m.-6:00 p.m.